There are certain segments of our culture that come close to satirizing themselves by merely existing, and the world of high-end art fits squarely into this mold. Or course, art is in the eye of the beholder, but when something like Jeff Koons’ Balloon Puppy Dog sells for $58 million dollars, then speculative pretension has already been discarded. 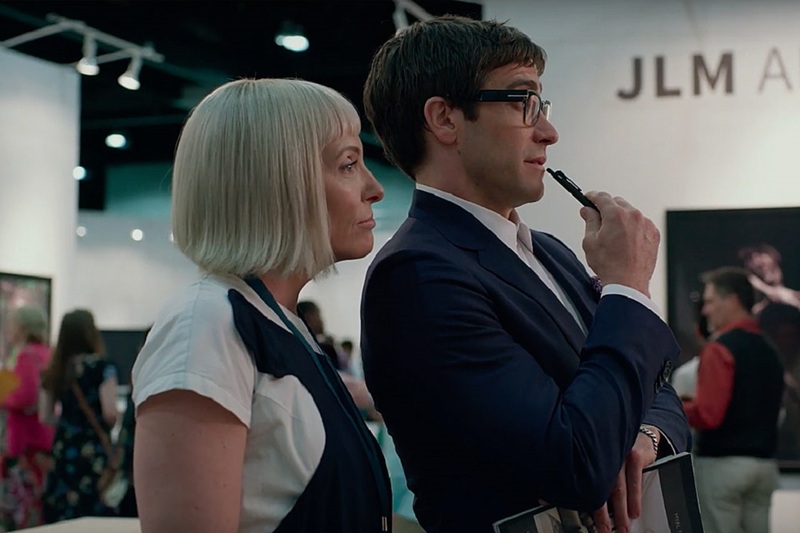 Dan Gilroy’s newest film, Velvet Buzzsaw, is a horror satire that takes place within the triangle of the dealer, the critic, and more abstractly, the creator. There is an argument to be made that this type of art is soulless and the sheer prospect of selling a piece of art for that amount of money in itself takes a type of moral emptiness. Gilroy is excellent at dealing with characters who exist on the edges of morality. His 2014 film Nightcrawler took a razor to the demands of the 24-hour news cycle and how the local stations thrive on the most extreme footage to boost viewership. Jake Gyllenhaal, who returns in Velvet Buzzsaw, is one of the great modern day Travis Bickle stand-ins. But, here Gyllenhaal plays Morf Vanderwalt, the ridiculously named critic of the L.A. art world. Supposedly, his reviews can make or break careers, a power that he yields with too much flippancy. He has an omnivorous sexual appetite and turns his eyes to Josephina (Zawe Ashton), the assistant to Rhedora Haze’s (Rene Russo) ultra-rich gallery owner. When Josephina finds an apartment full of art in her building, she pulls it all out and hides it away so she can start to sell it. It turns out this art is quite good and since the artist has died, the price tag will be even higher. Everyone is profiting, until the collection begins to elaborately kill each person who has dealt with the art. Much of the second half follows Morf as he senses that he will be hunted down by the departed soul of the artist, Dease. This premise sounds much more tongue and cheek than it ultimately becomes. The deaths are fun on paper, but they lack any driving cinematic verve to them. If you know the premise of the movie, there is no way you don’t see the big show-stopping death coming when Gilroy introduces Sphere in the first scene. Sphere is a smooth, reflective sphere that has holes for you to stick your hands in. When this death eventually occurs, it is almost muted, like much of the film. 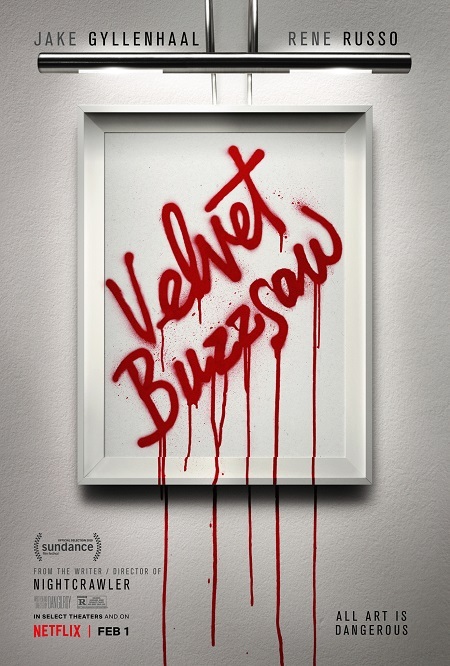 To work, Velvet Buzzsaw needed to be 50% wilder and out of control. Much is made of Morf’s sexual appetites, but in the end, he is nothing more than a slightly hornier than average person. This is a movie that needed to dive headlong into exploitation, whether it be sexual or violent in nature. There is a death that occurs from a piece of art that is essentially a walking prosthetic, but it is shown from the least interesting angle so that the audience is at a remove, never really knowing what’s happening. Gilroy showed some genuine talent for seedy characters in Nightcrawler. It is very easy to see how this group of morally repugnant characters would interest him as well. And still, there is a dull and indecisiveness to the critique. To work, satire needs to be razor sharp, cutting to the bone, but never rupturing the surface. The exact opposite is true here. Gilroy goes for broad jokes about these people so that they are never truly human. Which means, ultimately, the deaths don’t really matter. They might pack some visceral thrills, yet they never really result in something the viewer becomes invested in. The only character with any kind of relatability is Coco (Natalia Dyer), she is an assistant to all of the powerful people at the center of this story at some point or another. She also possesses a knack for stumbling upon dead body after dead body. She is from Michigan, because of course she is, just trying to survive in this cutthroat world without the fangs to really make it. Gilroy seemed like he was a writer and director that was going to go places with his career. But, his last two films have stumbled out of the gates. This one, produced by Netflix, is being dumped on streaming with little fan-fare. Granted, I don’t see this playing well to a theatrical crowd, but Netflix seems like the perfect place for a story about murderous paintings that are driven by the profits of their victims.